After purchasing a fancy DSLR camera most hobby photographers toss the intimidating user manual and jump straight into what makes sense by setting their camera to Auto and snapping pictures. However, it’s more than common that beginners soon start to complain about their equipment because it doesn’t produce the captivating images they were promised when they purchased the camera. The thing is a DSLR camera is only as good as the knowledge and skill of the user behind the lens. What that means is that in order to take better pictures and get the most out of your investment you must first get out of your comfort zone and out of Auto mode. What is the most vital component in creating a great photograph? L I G H T! Without light, photography would not exist. The word photography comes from the word photo, which is Greek for “light”. Before you can understand photography, you must first understand light and how your camera captures light. Even if you have the most sophisticated of cameras without light your photos will be impossible and your camera useless. Aperture is the hole in the lens which controls how much light passes through to the sensor. The diameter is represented by a focal length ratio. At first this can be confusing as an aperture of f/2.8 is larger (or more open) in diameter than an aperture of say f/8. The larger aperture, f/2.8, allows more light to pass through. In addition, aperture also controls the depth of field, which determines how much of the image is in focus from foreground to background. An open aperture of f/2.8 would be good for keeping your subjects in focus while blurring the background while an aperture of f/22 would be better for landscape photography when you are trying to keep everything in focus from foreground to background. For a better understanding of the relationship between aperture size, depth of field and light I created this aperture cheat sheet. Shutter Speed is the unit of measurement which determines how long the shutter of a lens remains open exposing the sensor to light. Shutter speed typically ranges from 1/4000 second to 30 seconds. The longer the shutter speed the longer the exposure time and the greater the amount of light that enters the camera. The main function of shutter speed is controlling motion. High shutter speeds, 1/640 to 1/4000, freeze motion while low shutter speeds1/15 to 30?, will blur it. High shutter speed is generally desirable because it will produce sharper images, but higher shutter speeds require more light to produce a good exposure. Low shutter speed will produce various motion blurs from moving objects or being handheld, but will allow more light to enter the camera creating a good exposure in low light situations. For a better understanding of the relationship between shutter speed, motion freeze and light I created this shutter speed cheat sheet. ISO is the standardized setting for sensor sensitivity to light. It typically ranges from 100 to 12800 in most DSLRs. The higher the ISO setting the brighter the image, but at the expense of noise. Noise creates random blotches of color due to the sensor trying to create more light. Try not to use your camera with auto ISO. It is always best to set your ISO to 100 and adjust higher if you cannot achieve enough light via shutter or aperture. For a better understanding of the relationship between ISO sensitivity and the noise resulting from creating more digital light I created this ISO?cheat sheet. Different cameras employ different control schemes to adjust shooting parameters but the most important is the control dial. The dial allows the user to select shooting modes. 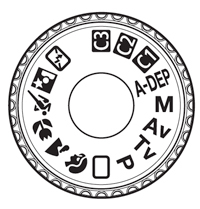 Av = Aperture Priority: User sets the aperture and the camera adjusts everything else manually. Tv or S = Shutter Priority: User sets shutter speed and the camera adjusts everything else manually. M = Manual: All parameters are set manually by user. For action I shoot in shutter priority so I can set my shutter to the fastest speed that will allow proper exposure and freeze motion. I will start with an ISO of 100 which will work fine outdoors but may need to be adjusted to a higher number when shooting inside in low light. For studio I shoot in manual mode. I prefer to set my shutter to 1/200 and my aperture to f/8 and then adjust the lighting to achieve proper exposure. Again setting the ISO at 100. For everything else I usually shoot in aperture priority. I base the aperture size on how much light there is and if I need to blur the background or not. As always I start with my ISO at 100. Email for Photographer rates and availability.